With all sleek straight lines, this gable style is constructed without use of any bending tool. Use the same kit to build any gable greenhouse from 6' to 10' wide using 17 gauge tubing or up to 14 ft wide using 14 gauge tubing. 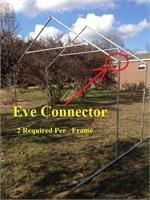 In the photo below we used two of these kits to build the 12x24 gable greenhouse as seen in Carols video. To build it 16 feet long, buy one of our add on interior frame set kits sold separately or for each additional 4 feet you wish to lengthen your greenhouse buy one add on interior frame set kit. (1 3/8" fence tubing not included). (Poly covering sold separately). 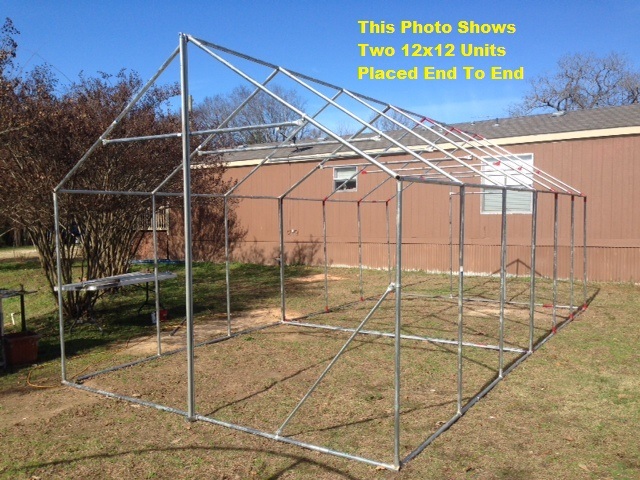 Enough connectors and angle bracing to build one 12'x12' greenhouse. Six Pc. connector kit allow for door framing on many styles of hoop houses. 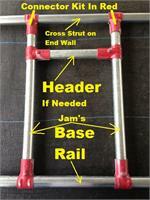 NOTE that our End Wall frame sets already have two of these sets included in that kit. Connector kit shown in red, tubing not included. These are individual 1 3/8" Eve connectors for our gable design for those who wish to coustomize their design. These are individual 1 3/8" gable peak connectors for those who wish to customize their own design.